This demonstrations allows you to explore a number of variables relevant for selective attention. It provides the ability to create separate streams of verbal information (in this case digits) that you can listen to. 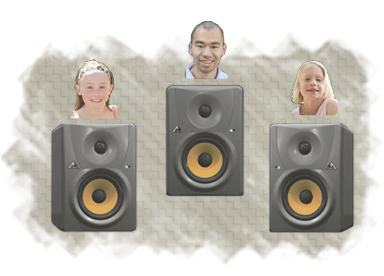 You can choose one or multiple speakers, different spatial locations, and even situations where the same speaker's voice is present at different locations simultaneously. Your task is to monitor one speaker at a particular location, or a small number of speakers at a number of different locations, and indicate when a target digit has been spoken, while at the same time trying to ignore all of the other speakers, locations, and non-target digits. Playing around with the demonstration will help you experience the role of spatial attention and the importance of similarity among speakers in making the task easier or more difficult.